Cherry Division of Textron, Inc. 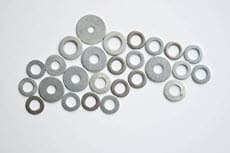 Commonly used in aircraft, KD Fasteners, Inc.’s Aluminum 2024 T4 flat washers are a good budget purchase while still offering high strength, good fatigue resistance, and a good strength-to-weight ratio. Aluminum 2024 is composed of aluminum, manganese, and copper with copper as the primary element. To achieve the T4 temper, metal is solution heat-treated and naturally aged. A T4 temper gives Aluminum 2024 the highest ductility compared to other Aluminum 2024 variants. While Aluminum 2024 T4 flat washers are not as corrosive resistant as stainless steel and will not work well in marine environments, they are a low density, economical choice for many other applications. We can offer Aluminum 2024 T4 flat washers to the specific dimensions and plating that you need. We offer off-the-shelf sizing ranging from 0.062 to 12 inch inside diameter and thicknesses from 0.002 to ½ inch. Whatever Aluminum 2024 flat washer you’re looking for, if we don’t have it on our shelf, we can quickly manufacture it for you. Our washer manufacturing capabilities range from small (under 100 pieces) to large runs. We will custom make your Aluminum 2024 flat washers to your exact specifications. Contact us today by calling 1-800-736-5014 or filling out our contact form. Looking for a custom fastener?